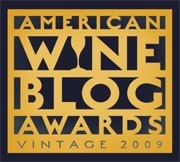 Over the weekend, Tom Wark of FERMENTATION opened up nominations for the 2009 American Wine Blog Awards. Don’t let the name fool you, these awards are open to any English language wine blog no matter where in the world it’s published. Last evening I cast my nominations in the seven categories which include the new Best Industry/Business Wine Blog category. Tom has dropped the category of Best Video Blog/Podcast category this year, which is not too surprising given how few wine podcasts are being regularly produced these days. I invite you to join me in casting your nominations for your favorite wine blogs by visiting FERMENTATION and posting your picks in the comments. From the first three days of nominations it looks like there will be a great field for the judges to choose the finalists. You have until midnight Pacific time February 8th to post.